The sun is shining, the trees are changing colors and leaves are gently dancing to the ground. The crisp mornings lead to warm afternoons, but one sniff of the air and you can tell something is different. The warm, floral scented breezes have been replaced by cool earthy, woodsy smells. No need to check the calendar, its officially fall. Fall is by far my favorite season. 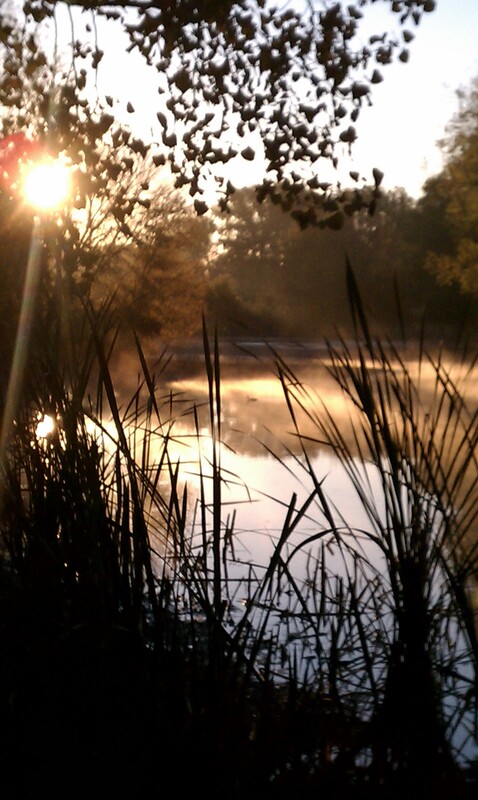 It’s cool and calm, the earth’s energy is slowing in preparation for winter. Squirrels and chipmunks run a muck burying acorns and walnuts in every nook and cranny (making a mess of my gardens and containers, mind you). The cool evenings invite fleece and flannel and back yard bonfires. And nothing spells a better weekend meal for me than my cousin, Tim Valley’s Bleu Rocket Pizza and a glass of Cabernet or Merlot. Simply put, it’s heaven. The only thing that could make it better is making this pizza in my backyard pizza oven, but that dream is yet to come to fruition. Some day… until then, I will continue to warm the house with the wonderful smell of garlic, the smokey prosciutto, the nuttiness of the walnuts and unmistakable scent bleu cheese. 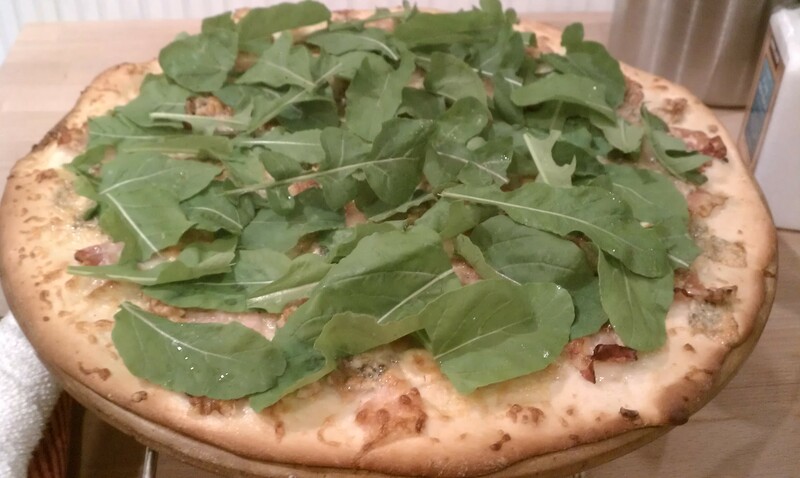 Top it all off with fresh wild rocket or arugula from your garden or local farmers market and its pure bliss. By the time this pizza hits the table I’m usually drooling. Tim, thank you so much for sharing this recipe, which has come to be a favorite in my house. And for everyone else, I hope you enjoy it enough to put it into your recipe repertoire. Add the first 4 ingredients into a large mixing bowl. Whisk in flour until whisk is sticky. Let rise 15 min. Roll as flat as possible onto lightly floured surface. Spray pizza pan with cooking spray or oil. Lightly flour the top of the crust, fold crust into 4ths (for ease of handling) and place onto pizza pan. Unfold crust. 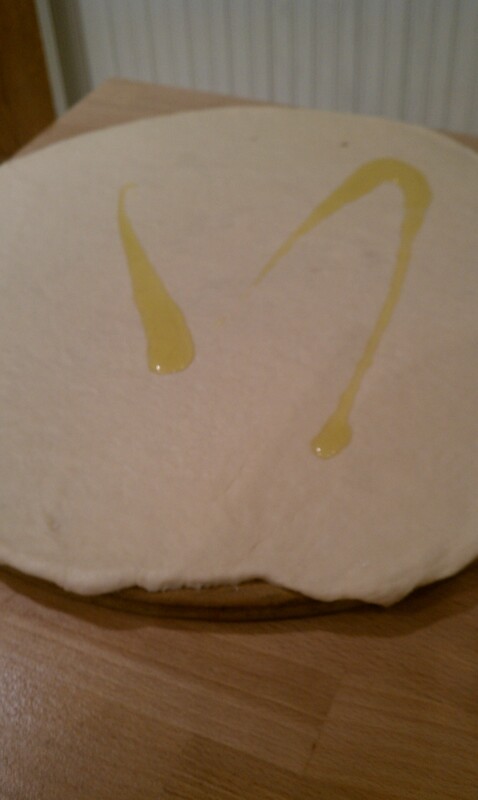 Drizzle olive oil onto crust. Using a pastry or silicone brush, brush crust with olive oil. 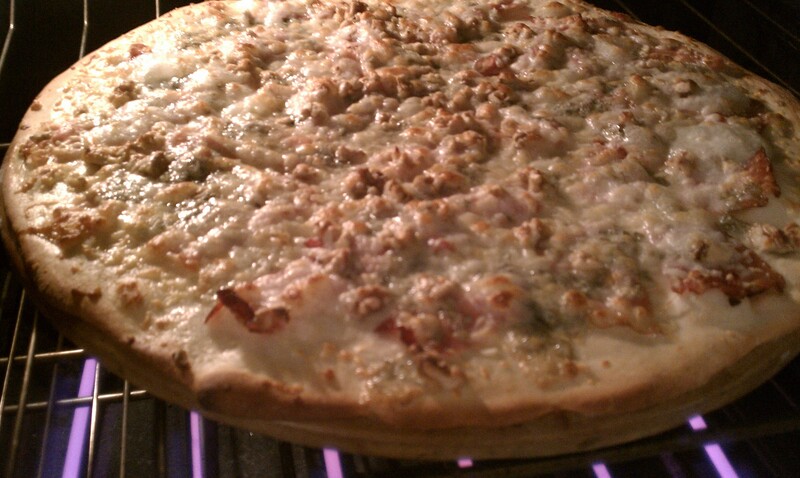 Spread chopped garlic over the oiled crust. 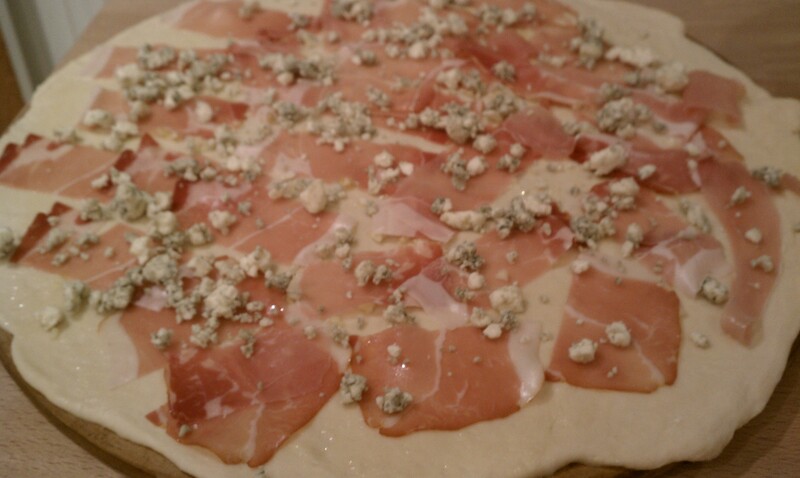 Lay prosciutto strips in a single layer over the garlic. Spread a small amount of bleu cheese over prosciutto (careful not to use too much or it will overpower the other flavors.) Sprinkle chopped walnuts. 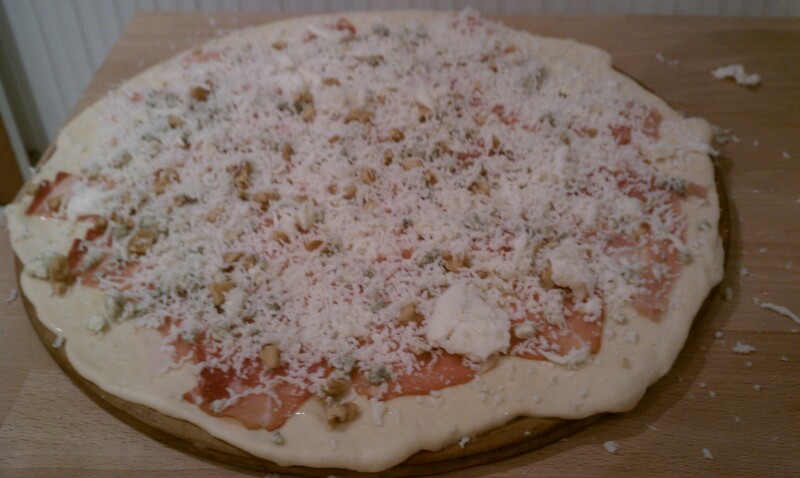 Spread a thin layer of mozzarella over the top. 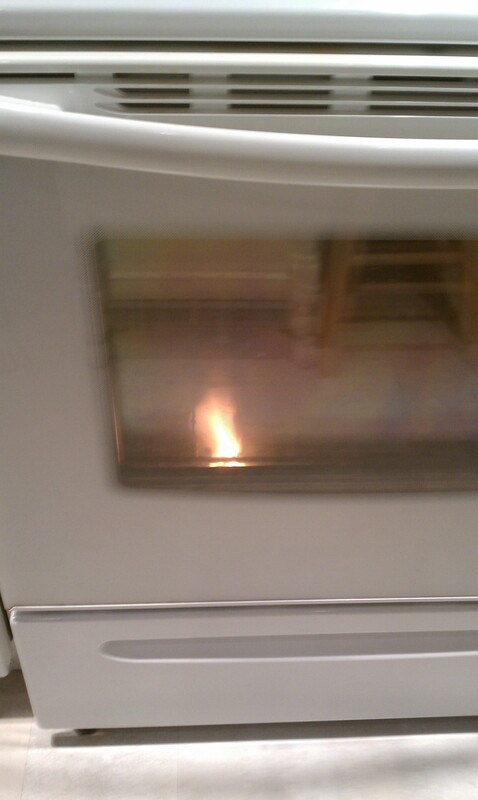 Bake in 500 degree oven until brown on top. While pizza is baking, soak baby arugula/wild rocket, spin dry in a salad spinner or place on absorbent towel. 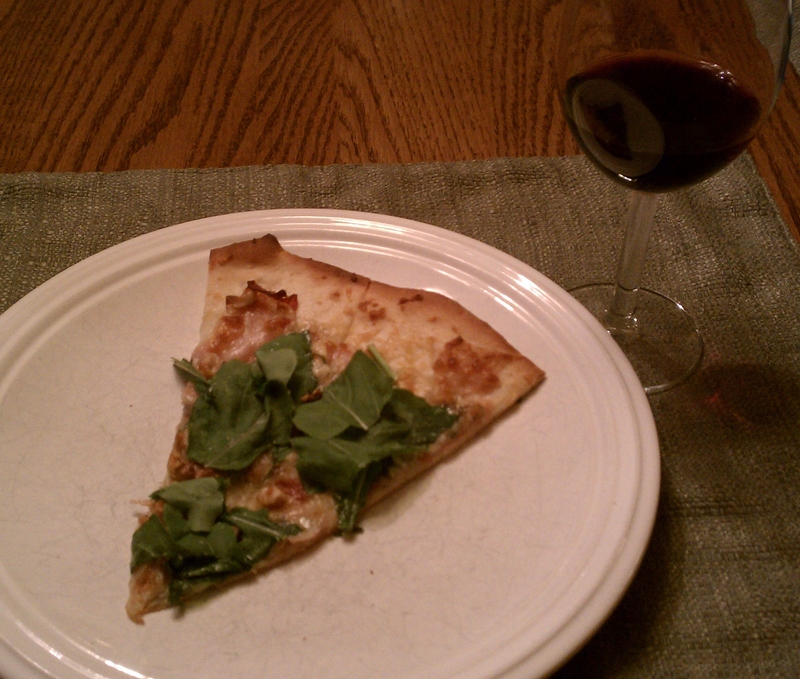 When pizza is done, remove from the oven and spread a layer of arugula over the top. Lightly season with a minute amount of salt (don’t over do this, there is already salt in the cheese and prosciutto) and pepper. For this post I’m offering a link to a recipe I found in Prevention Magazine a number of years ago and haven’t let out of my sight since. This is my go-to recipe anytime I have a cough or cold and since I’m still battling the flu, as I was brewing-up a batch, I thought it would be a good time to post it. What I love is this is simple, soothing and safe for the whole family. No nasty medicine taste or chemicals, just garlic, fresh lemon juice and honey. The recipe makes 4 cups of which you warm and sip 1/2 cup 3 times a day. Usually, unless I’m battling a really tough bug, one batch will be enough. I hope, in the case you ever need it, you find it as soothing and healing as I do. If patience came in a bottle, I’d be all over it today. Actually, my day started off quite well. I was a chaperone for my son’s class field trip to the MN History Center. You would think that with tons of kids around, noise and commotion everywhere, that my patience would have been tried, but it wasn’t. I was fine with that. I had a small group of four that I hung out with, checking out all there was to see at the museum. We sat in a C-47 warplane and experienced a crash on D-Day, we huddled in the basement while the house shook as the 1965 Fridley tornado went over, we took a walk through time in a house built in 1887 at 470 Hopkins Street that had over 50 families live in it, we took a stroll through life in 1968 and even spotted Dr. Martin Luther King Jr. It was all great. The kids were great. We took it all in and the day flew by. Then I got home and everything went off kilter. My son had a hard time listening and focusing on what he needed to be doing. He wasn’t doing anything bad really, just not doing what needed to be done, when it needed doing. Then the dogs knocked over the lamp for the second day in a row while barking at the mail carrier. I know, I know, just move the lamp, right? I would, but I’m trying to break the dogs of this habit (although I think they’re going to break me first). I was also trying to do more research for the Garlic Experiment (because I didn’t find what I was looking for last night) but wasn’t having much success, which was adding to my frustrations. Then there’s my huge pet peeve, lack of communication. Communication is really important to me. Conversation is important to me. When I don’t get a response I get frustrated. That was happening too, or shall we say, not happening. All of these things combined made me feel like I was loosing my grasp on life. Then I stopped and took a breath. I took a step back and tried to figure out how I could go through the entire day with tons of kids and commotion and be fine, but get so frustrated by the smaller things at home. I came to the conclusion that it’s because I had no expectations earlier today. I was ready to go with the flow and adjust on the fly as necessary. Home is a different story. Even though my personality lends me to like to operate more freely, I still have a need for an agenda. It’s probably more loose than others have, but it still exists. And that, my dear Watson, is my problem. When I do have an agenda with expectations as to what needs to take place and when and things don’t go according to plan I get frustrated. Why? Some may say it’s because I’m a “control freak” but I really think it’s because I don’t have a lot of expectations, so when I do ask something of someone (I think dogs classify as someones too) I expect them to work with me, at least after a few requests! So, my deal to sort out. Do I need to learn to just go with the flow on everything? Become more strict about my expectations? Or do I take a dose of patience and come back to it with a better attitude? Right now I’m leaning towards the latter. As for the Garlic Experiment, I’m leaning toward making an educated guess and winging it. More on that later. Feel free to weigh in on any part! And if you know where to find a little patience, please send it my way. In the mean time, I think I’ll dust off my Guns N Roses CD and breathe. I have a confession to make. Remember last fall when I wrote Growing Garlic? and told you the time was right for planting, how to go about planting it, so on and so forth? Well, guess who didn’t get out there and plant her garlic before the ground froze? Yep, you guessed it. Me. So what’s a girl to do about this? Well, let me tell you. Tossing the garlic heads was never an option. It goes against my grain. I had to do something with it. Given my background in gardening, landscaping and horticulture, I know that certain bulbs, flowering and edible, need a cold spell to get the bulbs to plump up for the next season. Garlic is one of them. But, I also know that if circumstances don’t cooperate sometimes you can fool Mother Nature and recreate that cold spell with a refrigerator (cold conditioning). So that’s my plan which I’ll be executing shortly and you can all ride along with me on what I will call the “Garlic Experiment”. What I can tell you right now is that this will definitely be an experiment. Some of the bulbs are already fading, they are no longer firm to the touch which means they’re drying out (not a good way to start off) but I’ll see how bad they are when I break open the heads and take off the individual cloves, at that point I’ll provide pictures and the play-by-play. But before I begin the experiment I had to do a little research. I already knew that garlic needs a cold treatment to get the bulbs to form, but what I didn’t know was how long they need to be cold to give the bulbs enough time to form. Since we typically don’t have a hard time finding cold weather for growing garlic in Minnesota, I had to start doing a little research on how southern gardeners grow garlic. So far my research has shown that garlic needs anywhere from 2 weeks to 8 weeks of cold to produce a bulb. Well, super! That’s pretty specific! That’s a lot like waiting for the furnace repair man to come and they say they’ll be arrive on Thursday, sometime between 8am and 5pm. Thanks for narrowing that down for me! (Obviously I have a little more work to do.) If you remember from last fall, I have 3 kinds of garlic . Tonight I’m going to do a little more research and see if I can find specific information on what each of them prefers and then go from there. Until then, please accept my apology for not planting when I advised you to. Life happened, so it didn’t get done. At least now we have an excuse for an experiment! And boy do I love experimenting with plants!